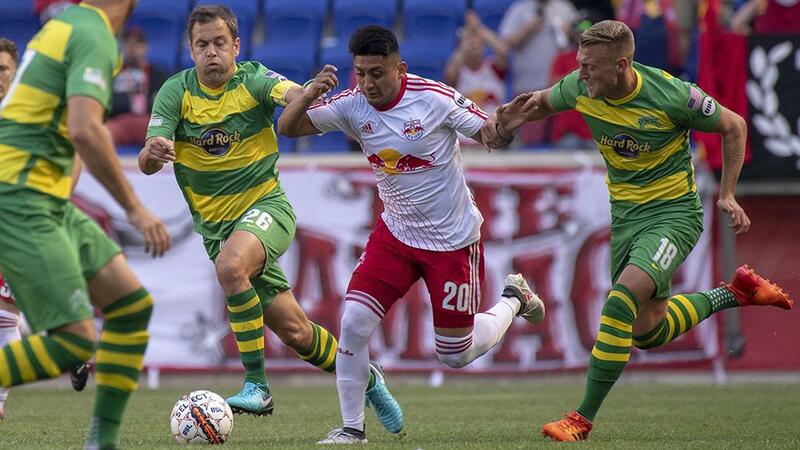 HARRISON, N.J. – The New York Red Bulls II took their third consecutive home victory to start the season as they romped to a 5-0 win against the Tampa Bay Rowdies on Saturday afternoon at Red Bull Arena. The Red Bulls II took the lead in the 18th minute when the hosts kept a corner kick from the right alive, and a low ball by Carlos Rivas found Fidel Escobar for a first-time finish to the right corner. New York almost doubled its lead nine minutes before halftime but Rowdies goalkeeper Cody Mizell made an excellent low save to deny Stefano Bonomo from 15 yards, but eight minutes after the break a clever layoff by Bonomo set up Jose Aguinaga for a driven finish to the top-left corner to give the hosts a two-goal advantage. Tampa Bay almost pulled one back immediately when Leo Fernandes was unable to get his header on goal, and a few minutes later Junior Flemmings was denied by a great save by Red Bulls II goalkeeper Evan Louro, but in the 61st minute Bonomo got free to finish as a low cross from the right made it through to the left side of the penalty area. The Rowdies threatened again with just over 20 minutes to go as Louro produced another good save to keep out Fernandes before Marcel Schäfer curled the rebound wide, but New York wrapped up the win with two goals in the final six minutes as Brian White notched a pair of goals to wrap up an emphatic victory. 1. New York took its third win out of three at home this season in a performance that saw the hosts produce a consistent display where its work-rate shone through to leave the Rowdies chasing for good spells of the game. The Red Bulls II won the majority of the game’s duels and aerial duels as they made it difficult for the Rowdies to settle in for most of the contest, making decisive challenges in tracking the Rowdies’ experienced side. It wasn’t a perfect display, goalkeeper Evan Louro was needed to make saves at key points of the game, but the Red Bulls II earned their first shutout of the season in moving ahead of Tampa Bay in the Eastern Conference standings. 2. The Red Bulls II’s passing and movement were on full display as Jose Aguinaga struck for a second consecutive game, with forward Stefano Bonomo at the center of the play. Bonomo’s angled run toward the top-right corner of the penalty area drew his marker away from the center of the field, and when the ball arrived his control and layoff set up perfectly for Aguinaga to produce a spectacular finish from the top of the penalty area. Bonomo added his fourth goal in three games this season soon after to give the Red Bulls II a three-goal lead as he continued to bedevil the Rowdies’ defense. 3. Tampa Bay really created only one good chance in the opening half, but immediately after going down by a pair of goals early in the second half the visitors created the chances that could have turned the game in a different direction. When the chances for Leo Fernandes and Junior Flemmings went astray – with Flemmings being brilliantly denied by former Red Bulls II teammate Evan Louro – and Stefano Bonomo quickly bagged a third for New York it proved too big a hill to climb for the Rowdies, who have now lost three of four all-time against the Red Bulls II. Stefano Bonomo, New York Red Bulls II – Bonomo had a goal and two assists, recorded three key passes and won 11 of 17 duels to lead the way for the Red Bulls II.